I initially refused to even look at the 'My Brest Friend' because the name is SO ridiculous! I find that the Boppy is easier to remove, wash & replace the cover. However, the My Brest Friend pillow is much better in many ways. First, it provides an elevated surface so that Baby's head is raised while eating. This essentially allows you to feed hands free. It also supports your back while nursing. I was gifted the Friend pillow when I complained of sore wrists from holding my heavy baby while nursing & it has been helpful in alleviating that pain. It also has a pocket. It is too bad the pocket has such strong velcro- it wakes a sleeping baby & distracts an older baby. Another downside is that you buckle yourself in- which can make quick transitions a little tricky. The Boppy can be used as a pillow for babies to sit in or lean over as they get older, I find that my babe is not interested in that at all. *The reality is that in most cases, a normal pillow slid under your elbow/babe's head will do just fine. Also, a rocking glider with arm rests & padding is ideal for nursing. My Pediatricians have one in their office & it provides nice arm support & makes standing up with babes in arms easier than a standard couch or lazyboy. It is also a very cozy chair that enables Mom to rest during those early months when Baby wants to feed often during the night. These rocker gliders are SO comfortable. This post is a list of things that are likely to become challenging, to varying degrees & for various lengths of time, at some point during pregnancy. I am training to compete in a one mile swim at the end of February. When I first found out I was pregnant I found myself feeling similar to a Mama whale, taking my baby for a swim in the pool. Swimming is great pregnant person exercise, and I love it. I do have to make sure that I bring water, and to eat plenty before swimming, and also to bring snacks for right after. Last week I had to stop swimming early because I was just SO hungry! I also find myself reverting to childlike eating habits (no, I'm not eating with my fingers...much). For example, I don't like sauce on my pasta, don't really like meat much, and I find myself having to remember to chew. I'm not kidding! I will be eating a banana or some mashed potatoes and realize that I have food sitting in my cheek pockets and what in the world happened that I forgot to keep chewing? Weird! I am very much looking forward to being a stay at home mom! below is a pic of our first sonogram. 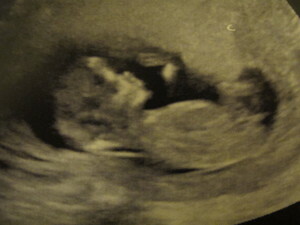 This page is an archive of recent entries in the pregnancy category. my Baby is the previous category.